Laura's Review Bookshelf: Fool For Books Giveaway HOP! THANK YOU TO EVERYONE WHO ENTERED. CONTEST IS NOW CLOSED. WILL PICK A WINNER TOMORROW! I WILL SEND THIS VIA E-GIFT CARD IF THAT WORKS FOR THE WINNER!!!! Welcome to the Fool for Books Giveaway Hop! This event features all book related prizes and is hosted by I Am A Reader Not A Writer & The Bookish Snob with over 200 blogs participating. The event runs from April 1st to 2nd. I'm a bit late in posting this. Please forgive me for that. All you have to do is just retweet this contest and post here that you have. Please leave your e-mail address as well so I can contact you! Good luck and have fun! PS: Friend me on Twitter as well! And if you friend me here on blog, you're entered to win The Lost Saint! See above for details! Well, I shall be the first to enter then. ;) I'll tweet this with you @ in the tweet. Thanks! Woo. I love contest. I need to post mine. Oh wait don't let me get side tracked. I retweeted it. I'm follower 399! You are almost there! Great blog and super giveaway. I look forward to returning and reading more of your posts. Have a great weekend! So you got 400 followers of which I am one. I also sent a follow request on Twitter @ManOfLaBook - and I don't think you're boring at all. Thanks for the chance to win and for hosting. And thanks for the giveaway . p;ease enter me to win! It's ok better late than never :) and I now have a twitter account yay so I can actually enter the giveaway. Thanks for the generous giveaway and for participating in this blog hop! Sent follow request on Twitter @MamaHendo3. Thanks for the chance to win. I love your header by the way, can I please borrow it (in the corners of my mind) for the ultimate perfectly cool place to sneak away and read undisturbed? 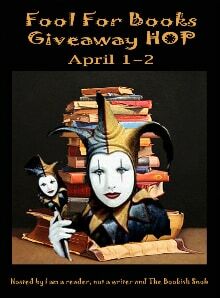 http://laurasreviewbookshelf.blogspot.com/2011/04/fool-for-books-giveaway-hop.html Giveaway of $25 GC for Barnes and Noble! i don't have a Twitter account but I do have a Facebook book page. I have posted a link there. I'm a GFC follower as Belle Découverte. From Tabathia. Deleted by accident.